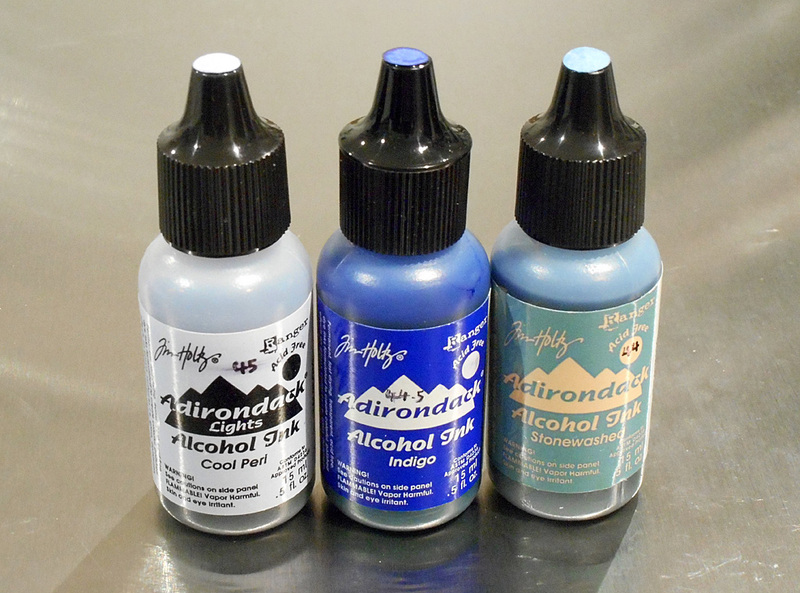 To make it easy to see the exact colour of each ink without having to shuffle bottles or refer to a separate chart, I glue a paper dot coloured with the relevant alcohol ink onto the top of each bottle. The paper dots are just punched out of standard copier paper using a regular hole punch. The example in the photo above punches holes for a 3-ring binder. Put a paper dot onto a piece of scrap paper, put a drop of alcohol ink onto the paper dot, let the ink dry, then glue the paper dot to the top of the appropriate bottle using a glue that will stick to the plastic but not soak through the paper dot and change the colour. 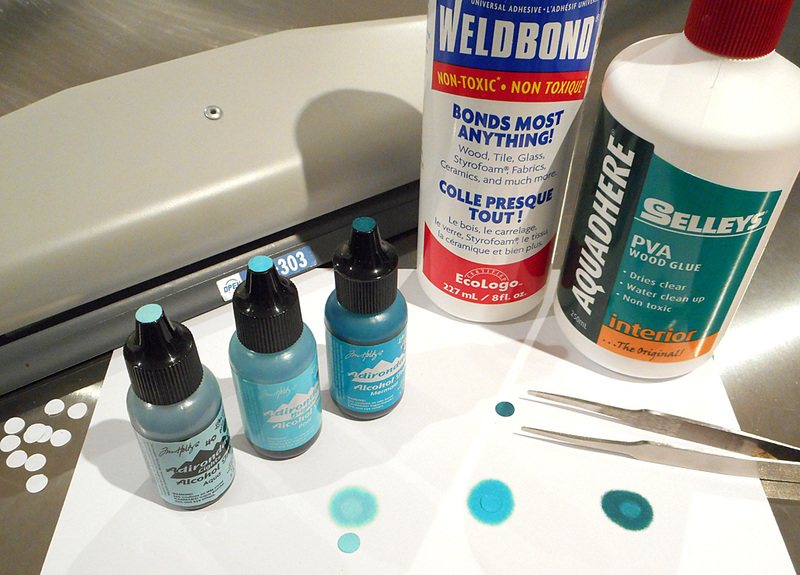 Glues I’ve used successfully include Selley’s Aquadhere Interior and Weldbond. I find it easiest to put the glue onto the top of the bottle, then use tweezers to position the paper dot before pressing it into the glue lightly with a fingertip. 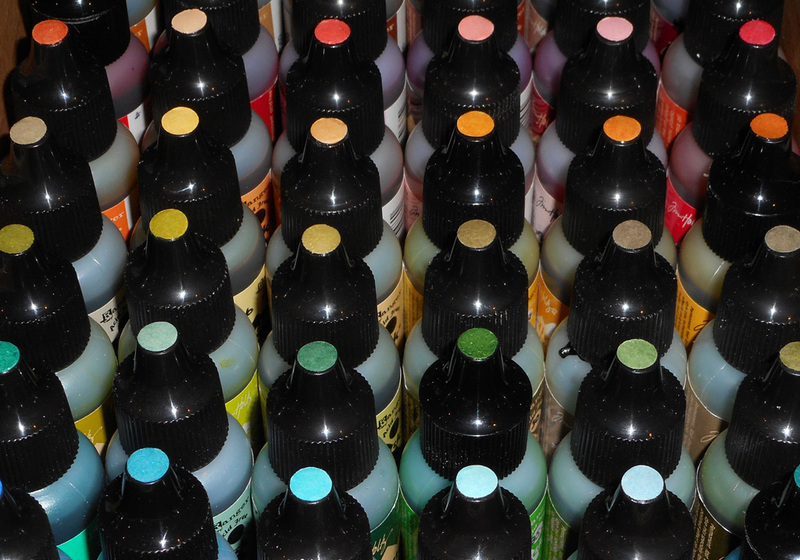 I store my inks in colour sequence, and being a control freak I also number each bottle to make it easy to put them back into “proper” order when I’ve had a lot of them out for use. These numbers were also very handy when I accidentally knocked the entire box of alcohol inks off my workbench and had bottles rolling around everywhere. It only took a few minutes to get everything back to where it should be. I also have larger samples where I’ve put a drop or two of each colour onto a small rectangle of paper, with the colour name, series and number noted down. I don’t use these very often so they’re normally clipped together in a wad in my alcohol ink box, but it’s sometimes nice to have a larger reference. 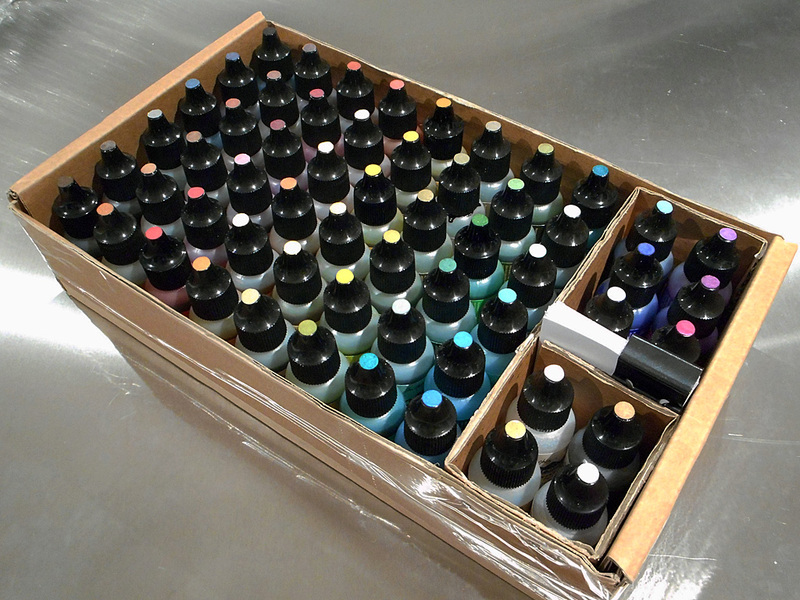 Here’s the order I keep my Pinata alcohol inks in. There aren’t anywhere near as many of these! Recently I’ve been experimenting quite successfully with Copic ‘Various Ink’ Refills and polymer clay, using them in the same ways I use other alcohol inks (colouring translucent clay, surface colouring and effects, etc.). 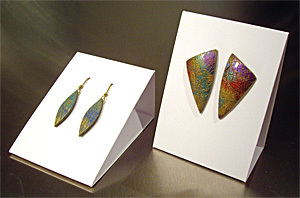 They come in a zillion colours which is handy as it’s difficult to find many clear, bright colours in the other alcohol ink ranges. I don’t have a huge number of these yet but so far the Copic colour number order works well.